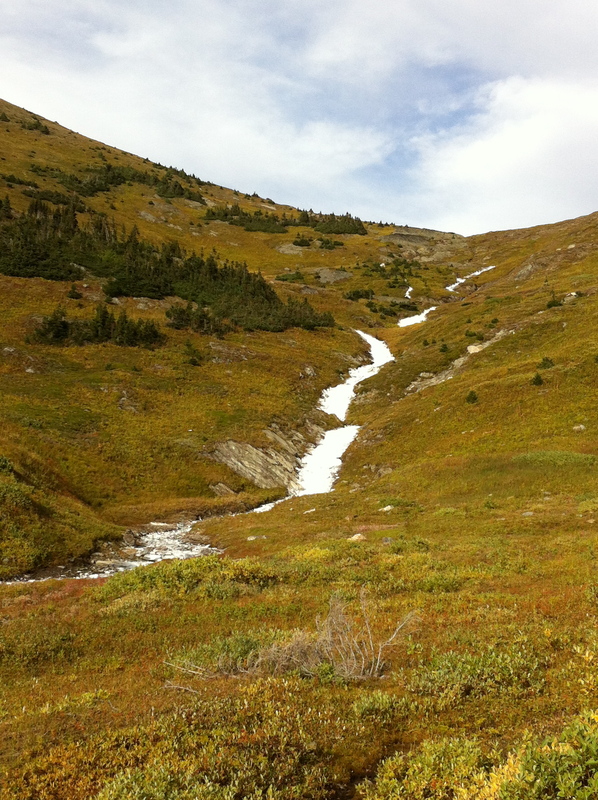 Take a look at the photo below, which I took it on the way up to McBride Peak (in McBride, British Columbia). It is a view up the Sunbeam Creek, part of an Ecological Reserve. Question: why would (only) part of the creek be so white? My father-in-law and I had been wondering since a previous hike to the top of the Peak, and speculations were running rampant. Finally, yesterday, we decided to hike up to the top again, then go down to the creek to find out. I think we did, and it was a great hike and a lot of fun. I am in the process of writing a nice post on this geo-adventure, but I though in the meantime I’d post the photo and make it a quiz. 2) this is a south face, exposed to the sun all day long, so it couldn’t be snow or ice. Below is a close-up photo. So, what do you think it is? Or at least, what do you think it could be? I want to say “soap suds”, but maybe some sort of runoff from the vegetation? Unless, it being a glaciated terrain, there is some kind of local rock flour that actually floats….? The change is stream and bank colouration is likely due to changes in stream water pH. 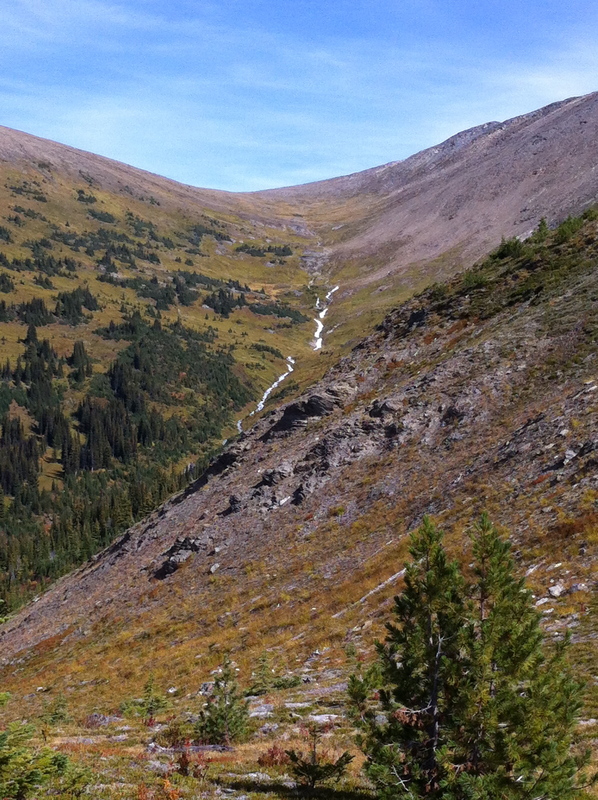 The uphill part of the drainage is red-orange – likely due to oxidation of pyritic rocks. Although it is not evident, the creek water and bed are red, brown or orange. The water and bed colour probably changes abruptly to a milky-white when the stream crosses a carbonate bed. The acidic water is buffered by the carbonate and calcium is then precipitated. In some cases, the whitish colour can be caused by the preciptaion of zinc oxides and carbonates. It makes for a good prospecting tool in areas that do not have a lot of carbonates.